One of the hardest things about Facebook is to increase the number of fans and likes, in a natural way and without breaking the rules. Creating a page, promoting a company, a community, a product, a cause, or simply sharing your thoughts, images and links is a fun activity, but when you you realize how difficult is to increase your audience, it may become less entertaining. Many of you are wondering how to reach numbers like 100.000 fans, when it seems already difficult to get just the sum of one hundred fans. In this article I write about tips and guide to manage and increase the fans and like to a page, but I do not explain tricks that violate the rules and guidelines of Facebook. Some pages have inserted such a welcome tab on their “like” buttons linking to other pages: in this way they require the user to have to click “like” to show the contents of the tab. This practice goes against the rules of Facebook. Facebook adopts different mechanisms to understand the origin of your fans : if they realize that few people have visited your page in comparison with users who clicked like, your page will be banned and your account warned. Pages which have made tens of thousands of fans in a few days were readily blocked by Facebook … Do you want to be like them? Increasing the number of fans and like without any special tricks is possible, just follow these suggestions. The first thing to do after creating a new page is to share it and suggest it to your friends. It may seem an obvious tip, but I am sure many of you still have to invite all your connections to your Facebook page (like NPI Fan Page). From the administration panel of the page (accessible to administrators clicking on the “Admin Panel” at the top right by visiting the page), click on the menu “Expand public” and choose “Invite your friends“. This will allow you to select which friends to send a notification, asking them to become a fan of your page. From that menu you can also share the page on your personal wall or on one of your friends. Of course be aware to not overdo, in order to not be labeled as spammer. Also, before you want to advertise your page, make sure to have a solid fan base and content. On both Facebook pages and profiles, you can get a unique username. This username identifies the page (or profile) of Facebook and offers a number of advantages. For pages is very useful and important to get a customized URL, because it allows your fans to reach you remembering your URL and to communicate with the address of your page by any means (for example, for companies on a business card), but it is especially important because it attracts new users from Google. Pages with a custom URL are best positioned on the search engines and thus attract new fans as well as common Google searches. Whether your page is created as joke or as a company or as business page it is essential to always produce and publish interesting content, that will appeal to other people and worth to be shared. Interesting content varies from page to page. You will understand the taste of your fans over time, selecting which news to share and knowing what affects users and what not (TIP : use Facebook Page Insights Tool). Another important issue is to establish a relationship with your users. You should then enable the message function and allow your fans to write to you and post photos, videos and links on your Facebook page wall. Always respond to questions, requests, and clean up your page wall by people who post SPAM links or simply you do not like. This will not take much of your time and you will be able to start interacting with your real fans. A great way to increase the visibility of your Facebook page and get more “like” is to organize games, contests and open discussions on your status updates. In this way it is likely to get more people clicking on your content and receive new fans. Even a simple status update as “Click like if you think Facebook is great” can generate a great response from your fans. Photos and videos are the kind of content that receive more feedback and more shares from users. You know that the more your content is shared, the greater your exposure and potential fans reached. So be sure to create different albums, but pay attention to add original images and videos, do not copy from other Facebook pages. Social Plugins are a great way to increase the visibility of your page. If you have a website, you should add a Facebook like box to help new users to find and click like on your page. You can also add a box for comments, which allows new visitors to comment on (and to publish your comment on Facebook) using their profile, or a box with the most read stories. Each of these tools can bring new users to your page. If you created a page to promote your company on Facebook (business page), you can send it to a number of email addresses (for example, your customers) by clicking on the menu “Expand the public” and “Invite contacts from email“. Each email address that you entered will receive an email, inviting the receiver to become a fan or like your page on Facebook. Whether your Facebook page is created for fun or to support a cause, it is useful to contact other administrators of pages and groups like yours, to let them know about your page and to share with them some of your interesting content. If your content is worth to be shared on other pages, this will increase your fan and like audience. Contacting administrators pages is now much easier thanks to the messages. If this feature is disabled write on the wall or comment on a post, asking for a contact with the administrator of the page. Of course : do not ask directly on the page about your desire to advertise, even worse publishing directly your link, as you may be reported as SPAM ! Many pages in no time get an exponential advantage of Facebook trends. For example, the current trend is to publish animated GIFs, images that are shared much more than static images and bring more users to your page. Tricks like animated images usually last not so much on Facebook (the time that they discover the deception and they will remedy), but managing to ride this trend, will rise considerably the number of your Fans. As you probably know, the founder and previous owner of No Passive Income is Chris Madej. He managed to make this blog popular in just 8 months and he was able to write a great number of high quality posts which ranked in the first page of Google for different keywords. 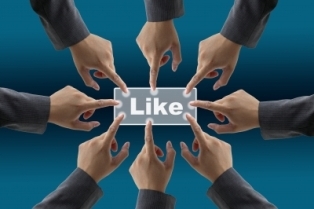 See for example : How to Get Likes on Facebook – 500 and More FB Likes in 2 days! So the suggestion here is to create articles about “How to Get More Facebook Like” or about “Reach More Facebook Fans”, make it rank number one for those keywords and you will get constant and daily facebook likes on your page! On No Passive Income Facebook page I receive a daily number of likes and fans, that vary from few up to 10-20, which is not that bad, considering it is organic traffic and natural visitors! Another tip is of course to add more than once in your article, a link to your Facebook page. Links poiting from images from my experience work better. The advice on how to increase the number of fans and like may vary from page to page on Facebook. In general, the most important “trick” (and on the web in general) is to produce interesting content. If your page follows just what everyone else is doing, will end up soon or will not grow that much, so try to stand out from the crowd and focus on the steps described in this article. Do your have more suggestions to add? I am increasingly getting concerned with Facebook’s hunt for a revenue model. They are charging for showing my posts to my fans and I find that strange. Now unethical because if I built my business’s traffic source on their land, but still they didn’t charge anything and now they want hundreds of dollars to be show my content in people’s feeds. You can still study some other free ways to publicize your content on Facebook. Interacting with fans and creating new post will bring likes daily. Other than that, we can embed social like box in websites. Other points are so general and not exactly related to the topic. Awesome post here Facebook likes are very important for getting a good amount of traffic everytime ! These guidelines regarding getting more Facebook likes is really cool. Interactions with fans is one of the most effective thing to do. And glad you decided to share and tweet the post! I am a Gamer, I play and record myself, I have a Facebook page with only 16 likes but thanks to this post I had gain more! Thanks so much for sharing Erik! I am glad you liked the article and the tips included in it. Enjoyed the idea of using pictures and other media to interest facebbok fans. Your simple request at the bottom of the article to like your page was very impressive. It got me involved. Thanks for the tips. I will use that tip. hey Erik, Great post. Good to see the starting saying ‘natural way without breaking the rule. Having lots of FB likes makes huge impressions. Thanks for sharing this post bro. Regards. It’s still possible to have real fans and real likes with Facebook, Koj. Facebook sponsored post is a great way to increase traffic as well as facebook like. Great suggestion Dipra, thanks for your comment! Glad you liked it, Rajkumar. I think the best thing is to Stylish your Facebook Page by designing a better cover and image. Glad to have you helped, Ashutosh. Your article was packed some great ideas! I never really thought about or took the time to follow the current trends. Standing out is how you can get more Likes and you have some very creative ideas on how to do that. Glad you enjoyed the tips included in this article, Cheryl. I hope that these suggestions will help you increase your Facebook page Fans! And Facebook is THE Social Network! You missed one of the best Facebook strategy to generate likes. It is using image for promoting the blog posts. It brings massive likes and traffic too. You missed my point #6, Pavan : “Use Many Media”. Great tips Erik…It is always difficult to get more facebook fans and likes if the topic or niche is not even remotely interesting.Great content always gets more fans..So i guess if you are able to share some interesting data as well as some pictures, then you are on the right track…Thanks for sharing this post..Much appreciated. Using Keywords in username and URL of the Facebook page also gives some traffic to Facebook page from search engines and in this way there are more chances to get more Facebook likes constantly. Thanks. Great ideas..very actionable items to help increase Facebook fans to any page. I suggest getting fans from Social Fat Boy when you first begin, That will help give your page a boost! Great promotion of Social Fat Boy, Beth. A mention here in the comments is allowed, though. Well,i think that serving proper content is more important than just garnering likes on your Page.Preservation of Clients and consumers is more important. Engagement and constant good content, in my opinion, Abhijit.